After a demo of the product at the 2017 Consumer Electronics Show, Chamberlain is shipping its MyQ Home Bridge, adding HomeKit functionality to MyQ-compatible garage door openers and compatible lighting. HomeKit compatibility with the new bridge is limited to the company's MyQ garage doors without built-in wi-fi, and its entire range of MyQ lighting. 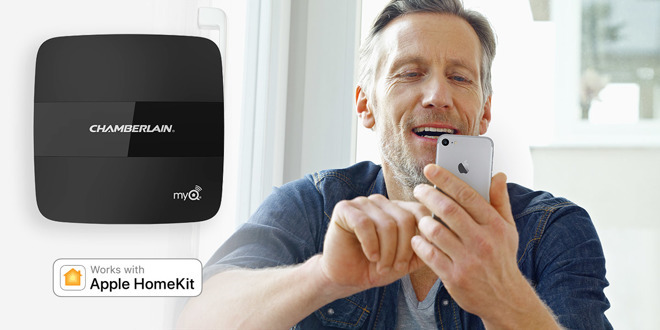 The company predicted initial shipments of the MyQ HomeKit Bridge in April. Also at CES, the company also announced a more universal bridge adding HomeKit control to nearly any garage door opening system. It was slated to ship in July, but there has been no update on the product yet. The MyQ Home Bridge has an introductory price of $49.99, but will climb to $69.99 at some date yet to be announced. A full compatibility list has been posted on the Chamberlain website, which is currently under significant load. The Chamberlain Group is the corporate parent company to LiftMaster, Chamberlain, Merlin and Grifco. Chamberlain is partnered with Comcast, Wink, Next, and Alarm.com with its MyQ initiative. The MyQ Home Bridge does not necessarily grant HomeKit compatibility with Wink or Nest products. Introduced in 2014, HomeKit allows users to connect to a variety of compatible so-called "internet of things" devices through the iOS Home app in conjunction with each other, as opposed to a series of apps with varying interfaces. The addition of Siri to the technology allows for complicated sequences of events previously set up to be induced from an iOS device by a single voice command.